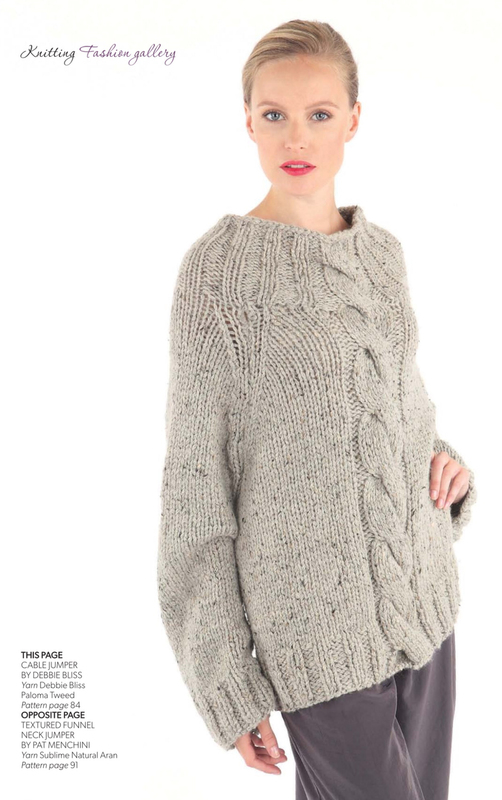 This issue of Knitting magazine comes with 21 knits for a cool, calm winter. 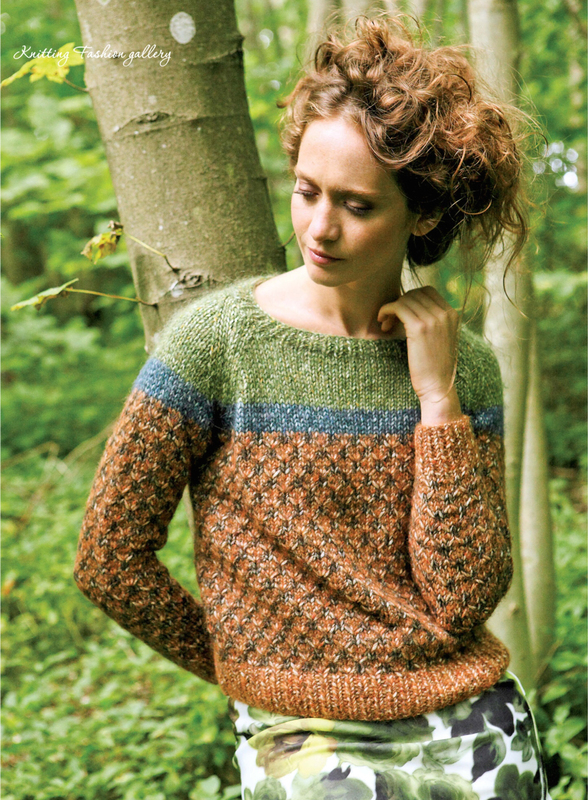 This jumper by Maisie Smith shows a lovely cable and bobble pattern floating on a background of moss stitch. It is shown here in Debbie Bliss Fine Donegal (95% wool, 5% cashmere) in shade Autumn Gold and Debbie Bliss Angel (76% suppressed mohair, 24% silk) in shade Gold. Both yarns are held together to knit this jumper. I’m a fan of the pockets but not really a fan of the ¾-sleeves. This sweater by Stylecraft is showing a v-back and a round neck front opening. Cables are knitted on front and back, the sleeves are knitted in plain stockinette stitch. Shown here in shade Emperor of Stylecraft’s Special Aran (100% acrylic) yarn. 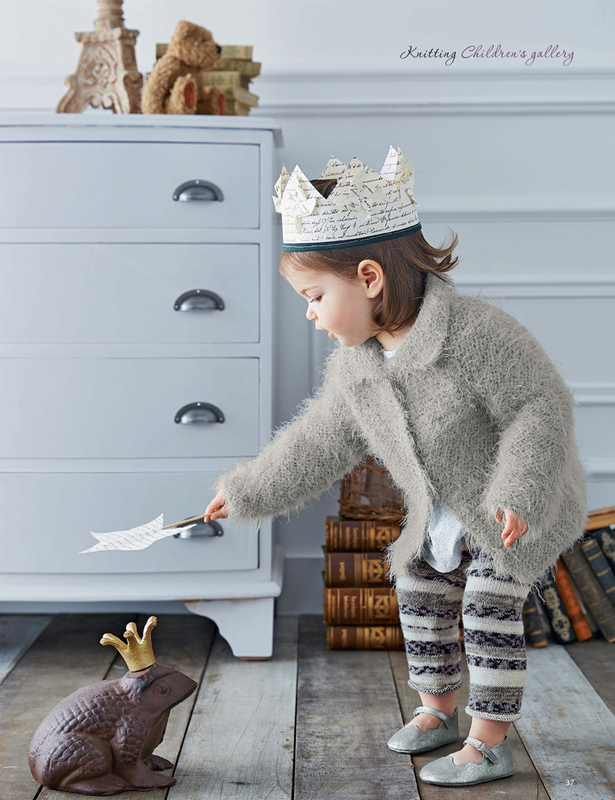 This chunky coat by Masie Smith is shown here in Rico Essentials Big Duo (50% wool, 50% acrylic) in shade Grey Melange and Rico Essentials Big (50% wool, 50% acrylic) in shade Stone Grey. This design has an asymmetrical one-button closure. The sleeves are knitted sideways. The Cable Jumper Dress by Sian brown is shown here in Debbie Bliss Blue Faced Leicester DK (100% wool) in shade Ecru. Small cables are knitted on front and back, whereas the sleeves are worked in reverse stockinette stitch. Also shown in shade Ecru but in Debbie Bliss‘ Cashmerino Aran (55% Merino wool, 33% acrylic, 12% cashmere) this scarf by Sian Brown is showing a cable pattern. Natalie Smart designed this Textured Yoke top, shown here in Todds Hand Knits Pura Lana Baruffa DK (100% virgin wool) in shade Mouseback Grey. The body is knitted flat and is showing a embossed pattern, the sleeves are also worked flat showing a cable pattern. All pieces are joined knitting the yoke, which is knitted in a rib pattern. This design by Pat Menchini shows a peplum in reverse stockinette stitch and a cable pattern on front and back. The sleeves are knitted in reverse stockinette stitch. It is shown here in King Cole Masham Misty DK (100% British breed wool) in shade Heather. This Chestnut Rib Coat by Judy Furlong is really great. It is featuring a rib pattern and has a interesting construction. A cable pattern is shown on the sleeve saddles. A modern high-low shape adds further interest. Shown here in Fyberspates Scrumptious Chunky (45% silk, 55% Merino Wool) in shade Deep Chestnut. Alison Robson is showing different cable patterns on this drop shoulder design. A pocket is added to the right front. Shown here in Rooster Almerino Aran (50% baby alpaca, 50% Merino wool) in shade Custard. This sweater by Pat Menchini is showing panels of cable patterns on body and sleeves. Shown here in Stylecraft Alpaca Chunky (80% acrylic, 20% alpaca) in shade storm. This Fairisle Shawlette by Sarah Hazell is a must have. I love the pattern and the subtle colours of this design. 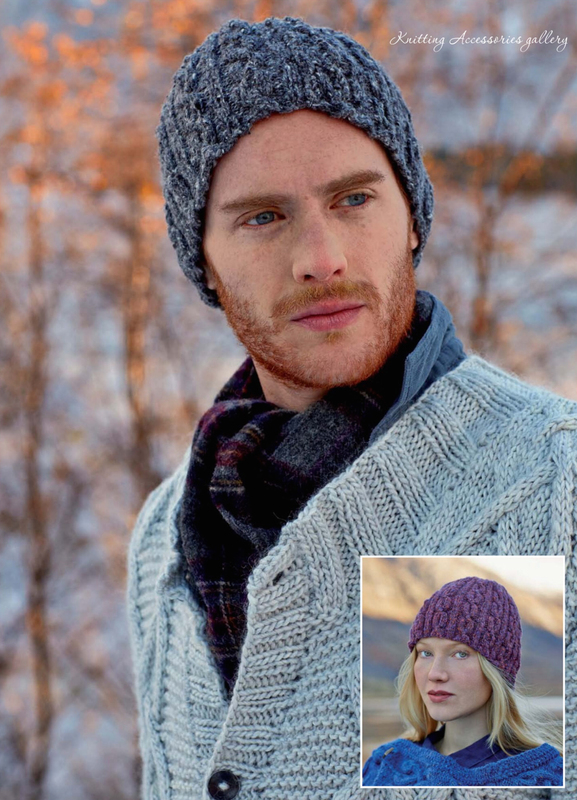 It is showing a fairisle pattern and a slip stitch pattern and is knitted in the round. Shown here in Rowan Felted Tweed (50% Merino wool, 25% alpaca, 25% viscose) in shades Ancient, Scree and Mineral. Aren’t they cute. 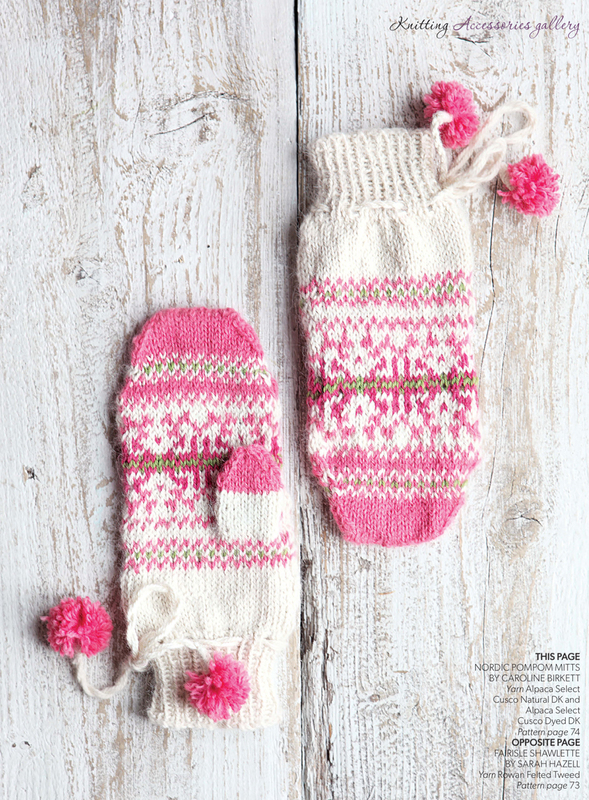 This Nordic Pompom mittens by Caroline Birkett are knitted in the round in fairisle technique and are shown here in Alpaca Select Cusco Natural DK (100% alpaca) shade Natural and Alpaca Select Cusco Dyed DK (100% alpaca) in shades Rose, Fuchsia and Lime Green. Size 10,5cm (4¼”) across x 20cm (8″) to finger tip, not including rib. These Boot Cuffs by Mindy Lewis are knitted flat and are showing a cable pattern. 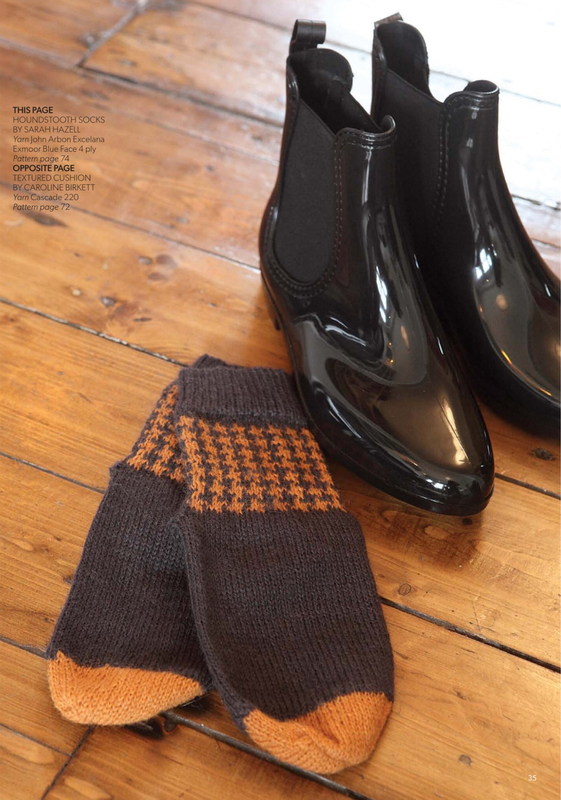 Shown here in Lion Brand Wool-Ease Thick & Quick (82% acrylic, 10% wool, 8% rayon) in shade Fisherman. 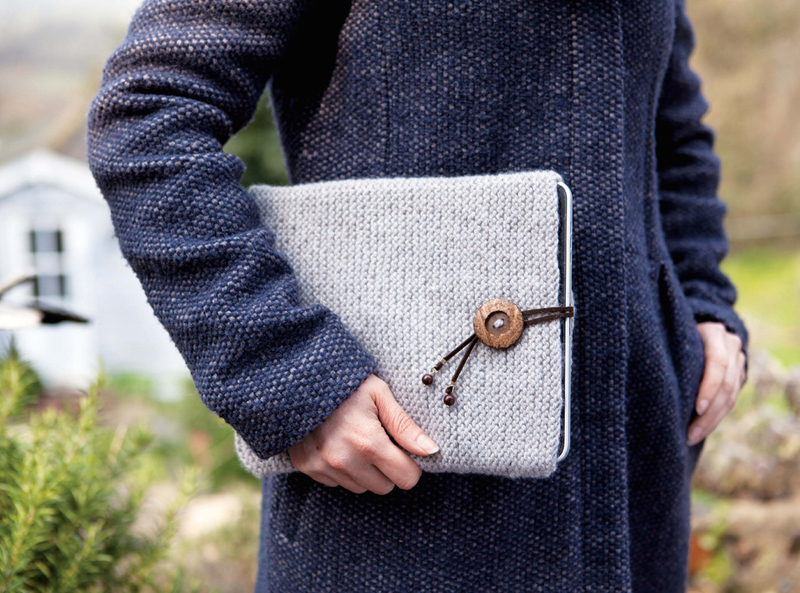 Tina Barrett designed this tablet cover, shown here in Blacker Yarns Swan DK (100% Falkland Island Merino wool) in shade Pale Fawn Sand. Finished Size: 19 x 24cm (7¾ x 9½”). This rug by Sarah Hazell is shown here in Sirdar Freya (55% cotton, 31% acrylic) in shades Lapland, Tundra, First Frost and Gosling. The yarn is knitted using two strands of different or the same shade to form the stripes. 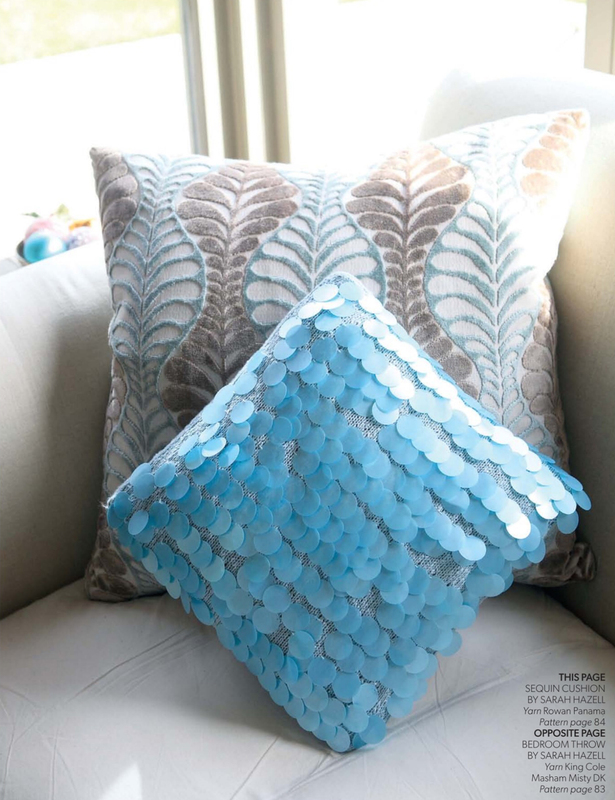 The Diamond Cushion by Sarah Hazell is showing a diamond pattern on the front, formed using slip stitches. It is shown here in Debbie Bliss Cashmerino Aran (55% Merino wool, 33% acrylic, 12% cashmere) in shade Stone. This vintage hat by Cony Larsen is crocheted top-down. A additional bow can be added. Shown here in Sublime Baby Cashmere Merino Silk 4ply (75% Merino wool, 20% silk, 5% cashmere) in shade Piglet. 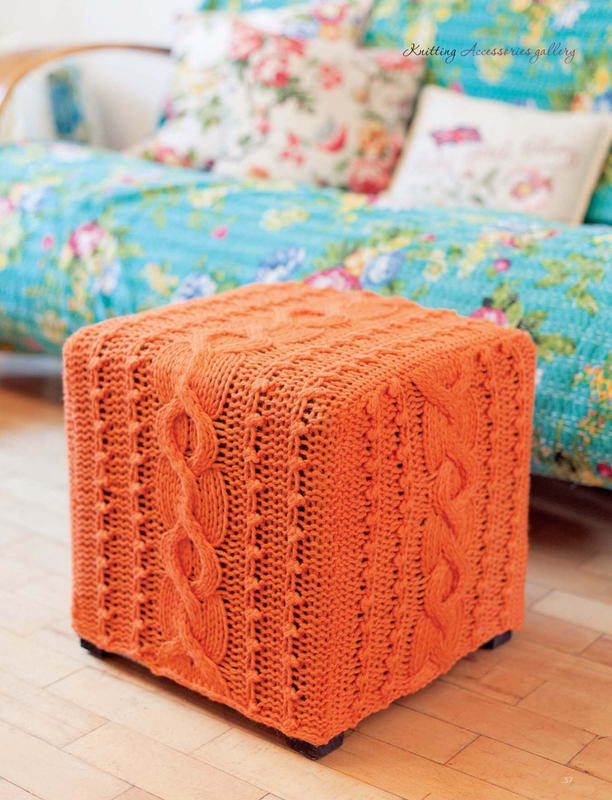 This pattern is also published in Simply Sweet Crochet by Cony Larsen, published by Design Originals. This Fluffy Jacket by Bergère de France is worked in garter stitch and is shown here in Bergère de France Plume (47% polyamide, 42% acrylic, 11% wool) in shade Gris clair. 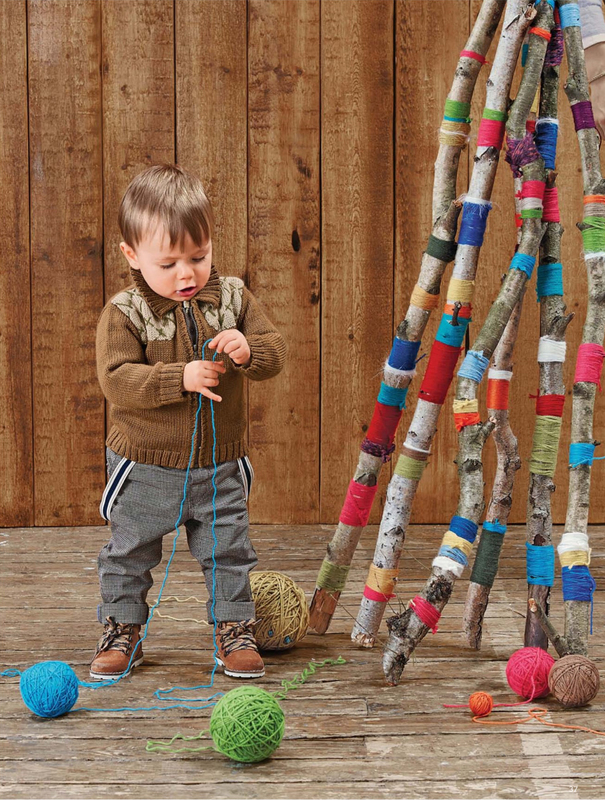 Use any Double knit yarn for the Hazle Jacket by Jane Ellison. It is knitted in garter stitch. So cute. Knitable in 5 sizes: 0-6mnth to 5-6yrs. 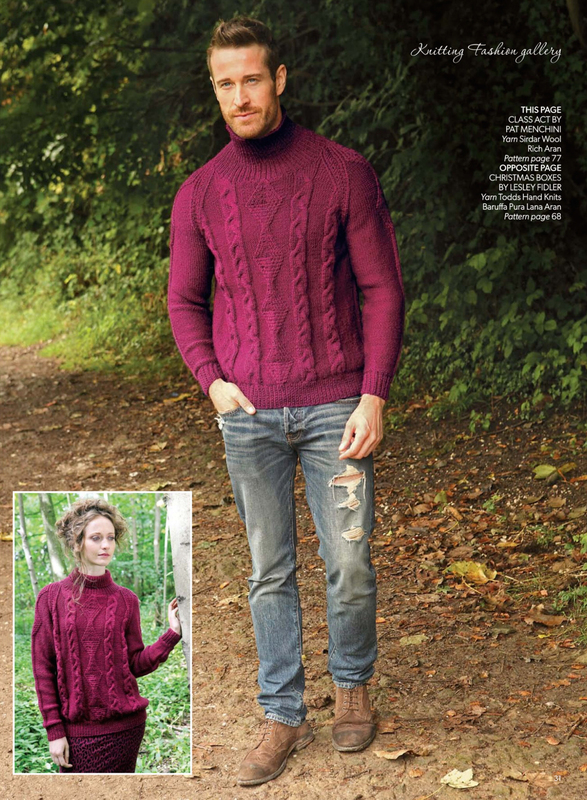 This cabled sweater by Sirdar is shown here in Sirdar Snuggly DK (55% nylon, 45% acrylic) in shade Cherry Pie. 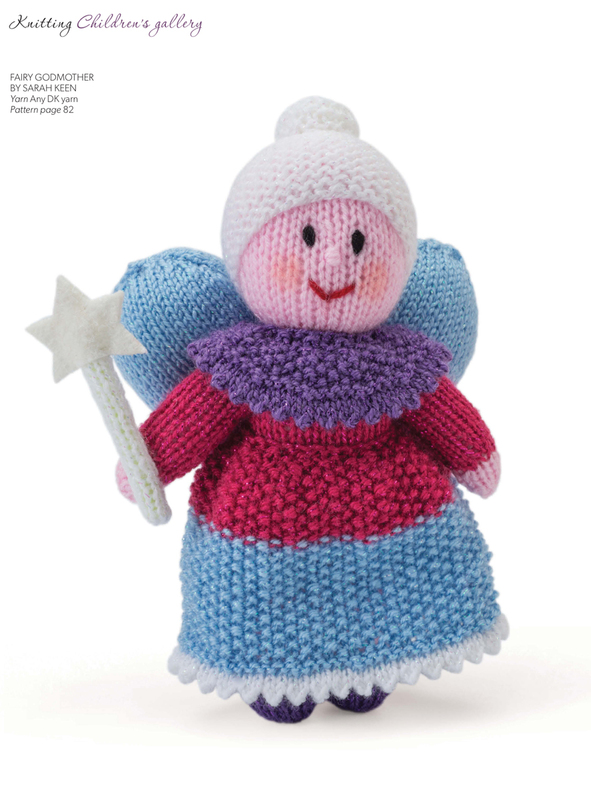 This Fairy godmother by Sarah Keen may be knitted in any DK yarn it is 23cm (9″) high. This pattern is from Knitted Fairy Tales by Sarah Keen, published by GMC Publications. 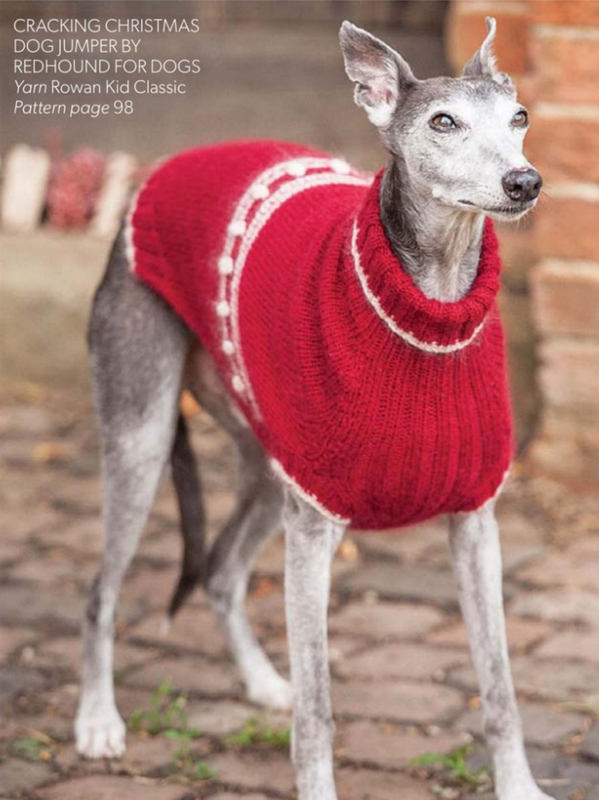 The next issue of Knitting magazine is already since January 15 with 20 fashionable knits. All pictures of the patterns above are screenshots from my iPad and my purchased copy of Knitting magazine December 2014. This issue of Knitting magazine comes with 30 knits for this winter season and it is looking like it is going to be Christmas soon. 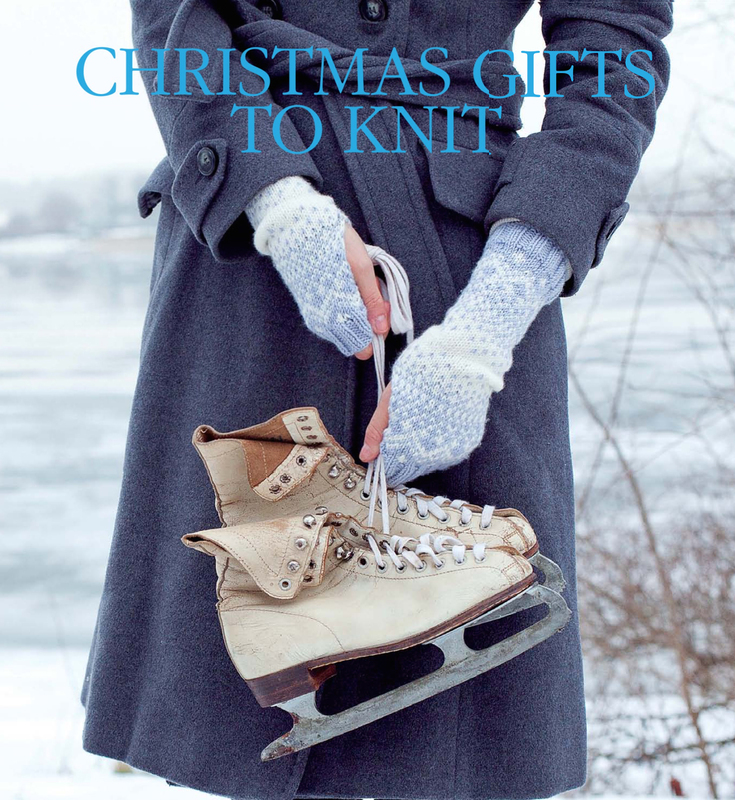 There are also 10 Christmas gifts to knit. Jo Allport designed her cable and fairisle jumper using two shades of Lousia Hardings Esquel (60% wool, 20% llama, 20% silk) yarn. 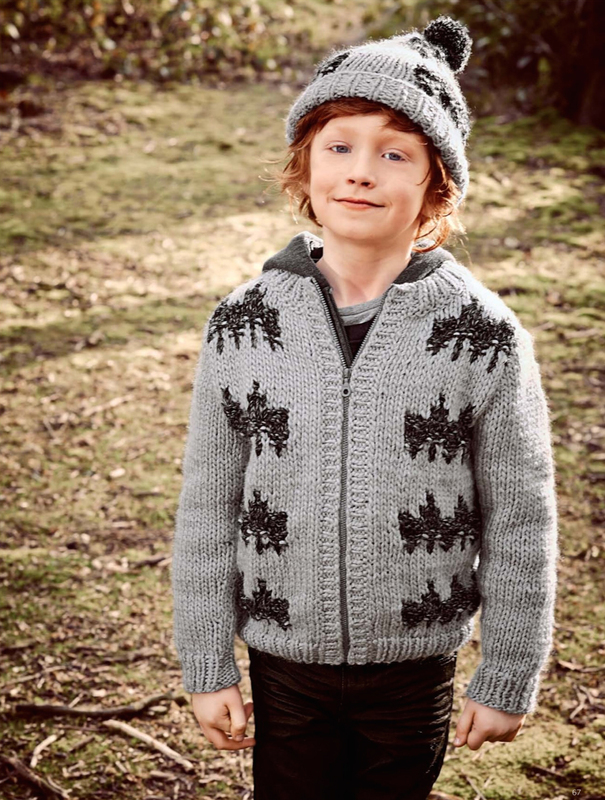 It is featuring a garter chevron edging, a fairisle pattern, drop shoulders and sleeves knitted in fishermans rib. A separately knitted stripe with a cable pattern is forming the neckband. Well there are a lot of design elements put together, but I do not really love the result. This lovely lace jumper by Sian Brown is knitted using Debbie Bliss Party Angel (72% mohair, 24% silk, 4% metallic polyester) in shade Grey/Silver 03. Maisie Smith has designed this feminine peplum top. About 500 beads (on smallest size) are threaded on Debbie Bliss Luxury Silk (100% silk) yarn. This design is featuring raglan sleeves and shaped side seams. A lovely beaded lace pattern is looking great on the peplum of this top. Beads are also on the neckband and the cuffs. Knitted in Sublimes Baby Cashmere Merino Silk 4 ply (75% extra fine Merino, 20% sik, 5% cashmere) yarn, this design by Amanda Jones is showing 3 different lace pattern on front and back. Beaded loops are forming welts on hems and cuffs. Pat Menchini used Stylecraft Eskimo Kisses (100% polyester), a yarn with a chenille core and a fluffy overlay, for her cardigan. It is featuring short sleeves and side seam shaping. 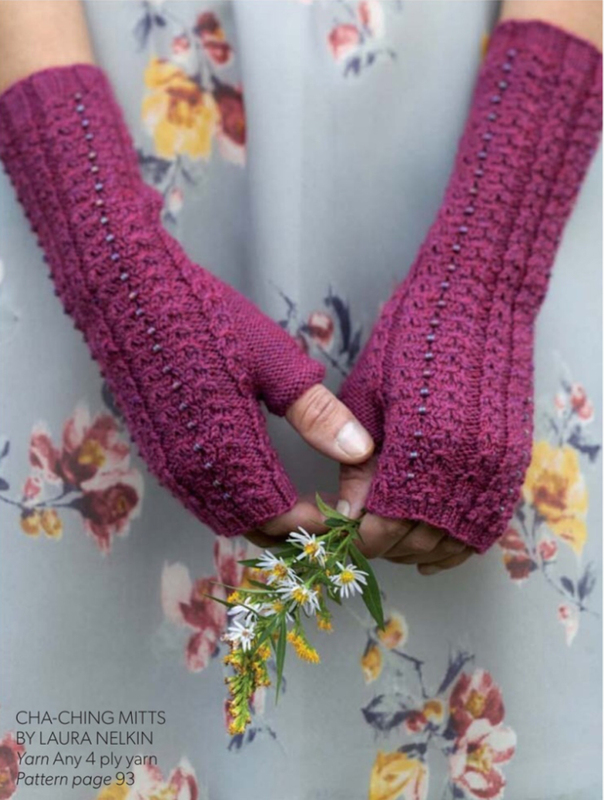 This design by Emma Wright is knitted holding strands of each Louisa Hardings Akiko (70% Merino wool, 30% baby alpaca) yarn and Louisa Hardings Luzia (80% viscose, 20% nylon) together. This is producing an on trend look – Faux Fur. Well, I’m not a fan of this look at all and I guess you all know, why! 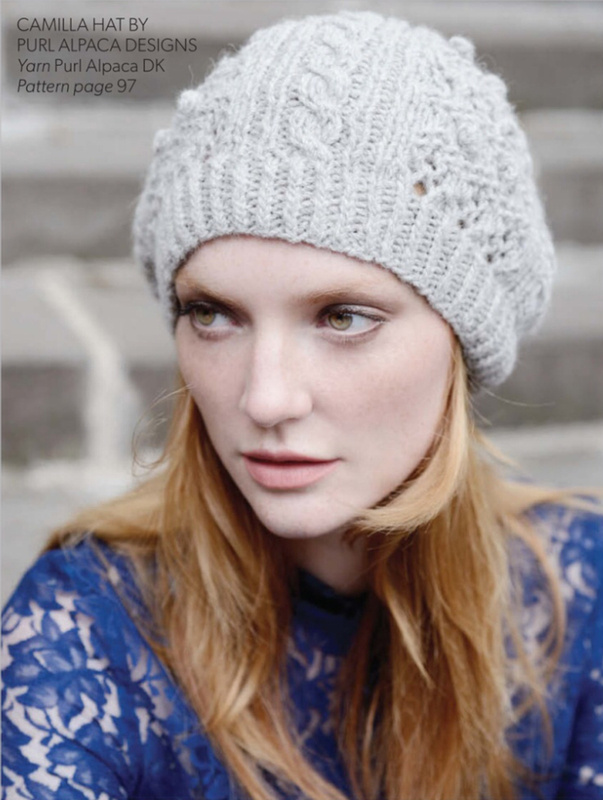 Karolin by Lisa Richardson is originally published in Rowan Knitting & Crochet Magazine 56. It is knitted in a great slip stitch pattern using Rowan Mohair Haze (30% wool, 70% mohair). It is featuring shaped side seams and a saddle shoulder. I have already written about this design, because it is part of my TOP 10 for this seasons pattern. 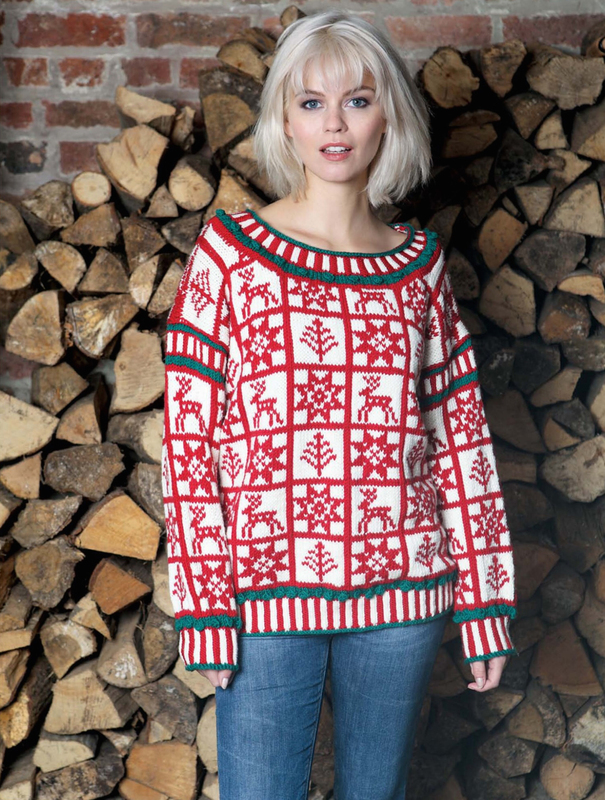 A lovely Christmas sweater by Lesly Fidler. It is knitted using Todds Hand Knits Baruffa Pura Lana Aran (100% virgin wool) yarn. It is showing different squares of fair-isle pattern and a corrugated rib. Bobbles in a third shade are adding interest. This sweater by Pat Menchini is showing diamonds formed by cables in the center and supporting braided bands on the sides. The diamond pattern is also on the raglan sleeves. A en vogue turtle neck is completing this design. Shown here in Sirdar Wool Rich Aran (60% wool, 40% acrylic) in shade Westbury 314. Bobbles, pompoms and cables are knitted on this wrap by Linda Parkhouse. Shown here in Rico Gigantic Mohair (40% acrylic, 30% mohair, 30% polyamide)! I like this wrap, unfortunately it is heavy, about 1400 g.
This Bedroom Throw by Sarah Hazell is knitted in King Cole Marsham Misty DK (100% British breed wool) and is showing am all-over cable and lace patter. Size: 30 x 30 cm (12 x 12′). 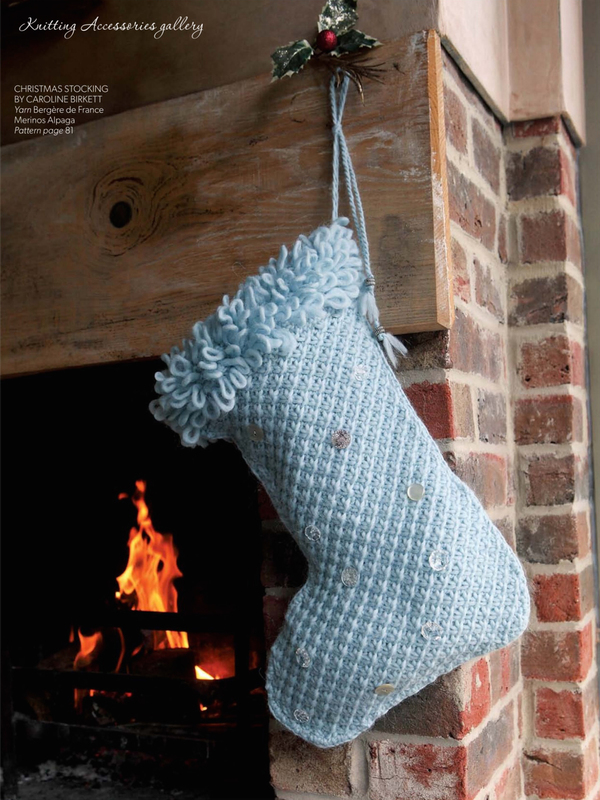 You want to knit a Christmas Stocking (for next year?). This one by Caroline Birket is knitted in a lovely textured pattern with a knitted faux fur edging on top, produced by wrapping the yarn around your thumb. Shown here in Bergère de France Merinos Alpaca (60% Merino wool, 40% alpaca). This hooded jumper by Lang is knitted in Lang Yarns Mille Colori Big (50% wool 50% acrylic) and is showing a fair-isle motif, knitted in Lang Yarns Mille Big (50% wool, 50% acrylic). 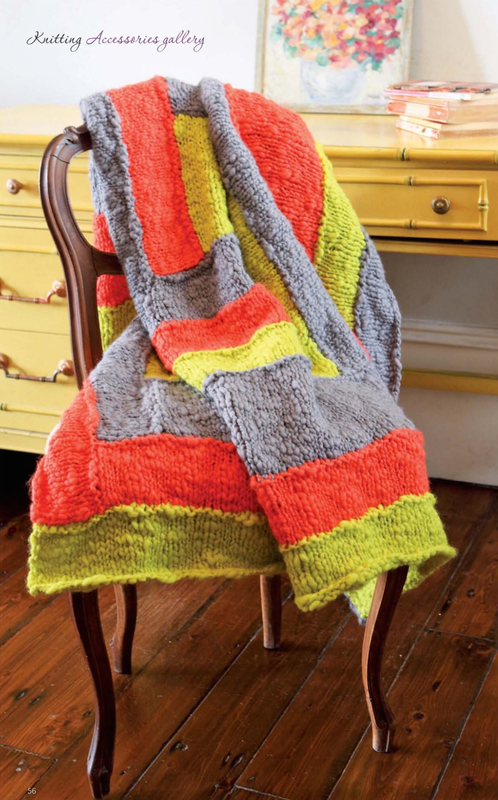 This colourful cardingan by Stylecraft is knitted in their Carnival Chunky (100% acrylic) yarn. The front is showing a four button closure on asymmetric knitted fronts. 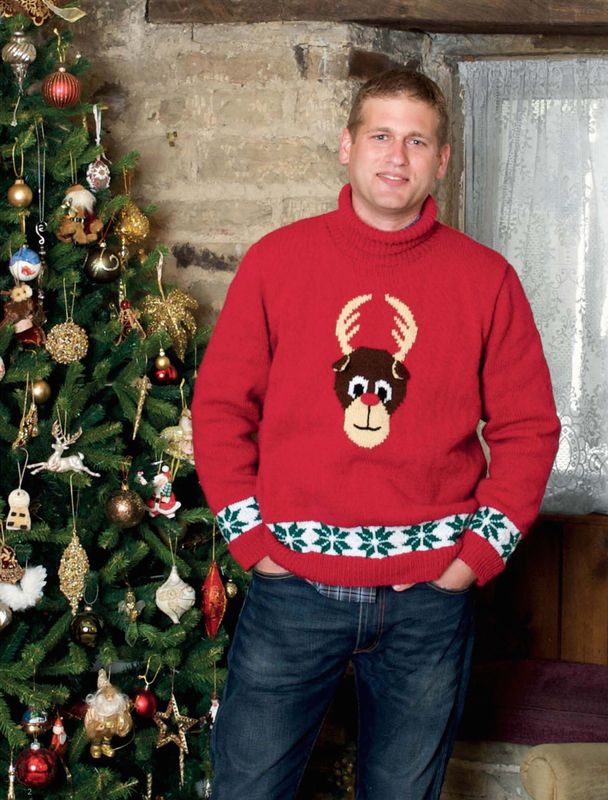 A lovely jumper by Dorling Kindersley, isn’t it. It is showing different fair-isle patterns in white and turquoise. Shown here in King Cole Merino Blend DK (100% superwash wool). 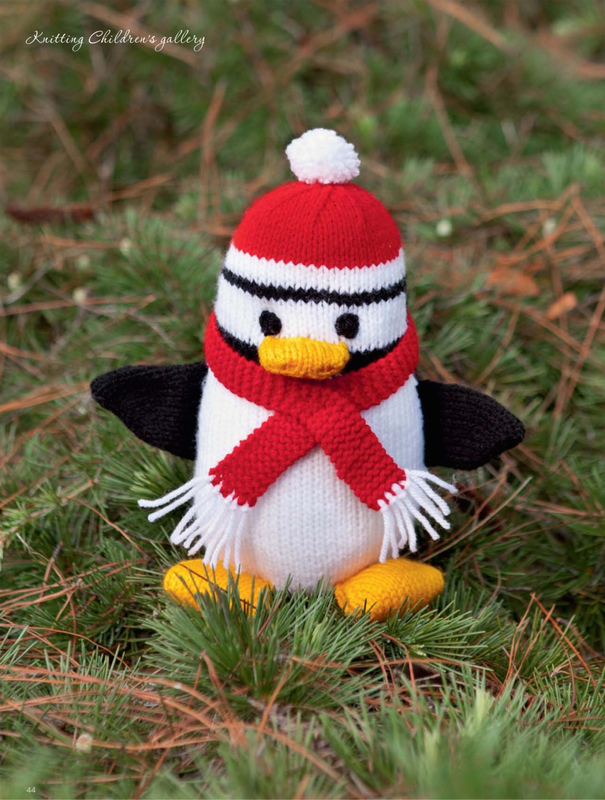 This Penguin Toy by Patons is shown here in their Fab DK (100% acrylic) yarn. 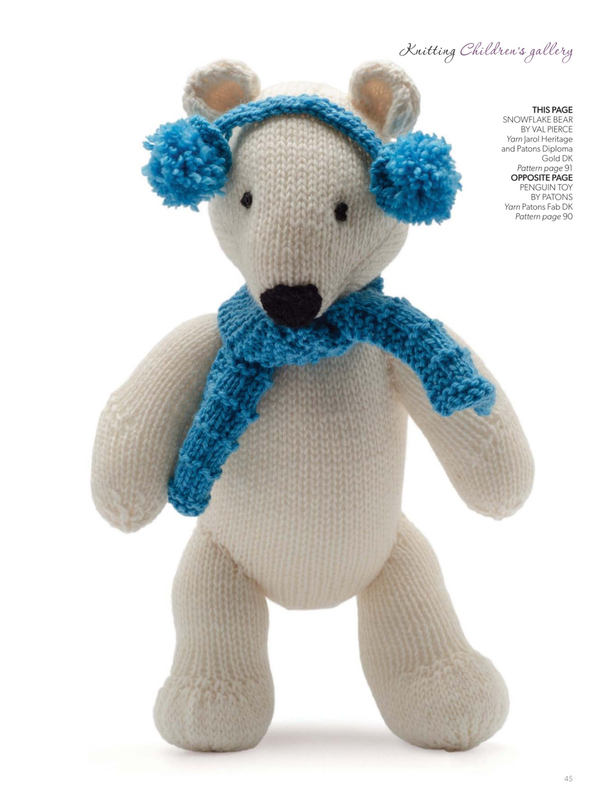 This lovely Snowflake Bear appears first in ‘Knit-a bear’ by Val Pierce, published by GMC Publications. It is shown here in Jarol Heritage DK (55% wool, 25% acrylic, 20% nylon). Approx: 26 cm (10′) tall when sitting. 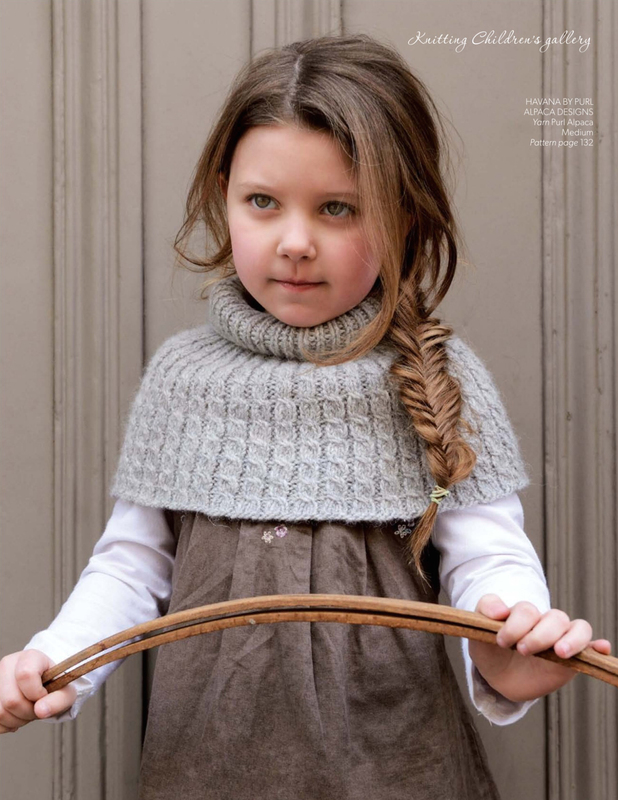 The next issue of Knitting magazine will be available on December 18 with 21 knits for a cool calm winter. This issue of Knitting magazine comes with 21 knits for late fall as the weather is going to get colder, also here in Germany. And it shows 5 Christmas jumpers for the whole family. This sweater by Marie Wallin is knitted in the new Rowan Fazed Tweed (72% wool, 22% alpaca, 6% polyester) yarn and is originally published in the Rowan brochure Fazed Tweed, a collection of 16 designs for women. The body shows a structured pattern produced by slip stitches, increases and decreases worked in two colours, whereas the raglan is knitted in stockinette stitch in two different colours. Sian Brown used 2 shades of Rico Design Eco Pure Chunky (100% wool) for this design. 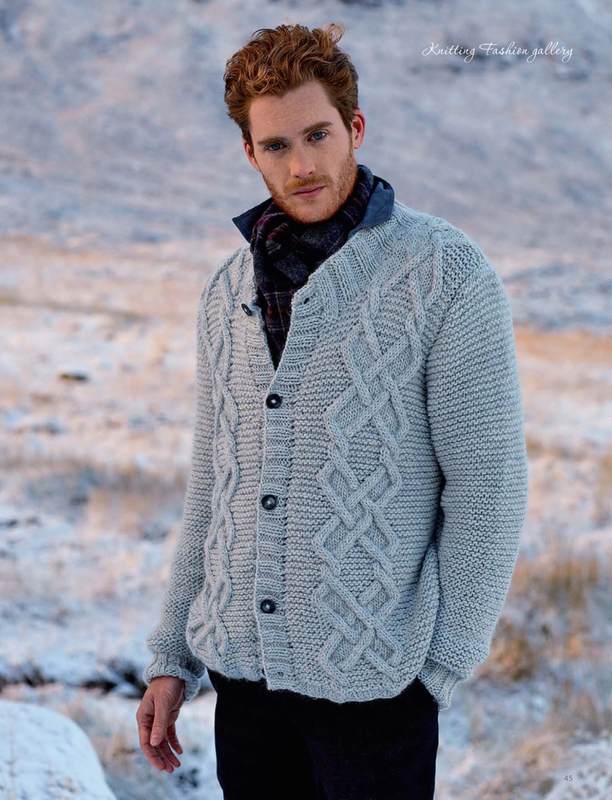 This long jacked is featuring a checked pattern knitted and a one button closure using fairisle technique. All pieces are knitted flat and joined together. The big collar and the front bands are picked up and knitted in a rib pattern. This jumper is knitted in a rib pattern throughout and is showing a rib increases shaping on the front. Worked flat from the bottom up, Natalie Smart used MillaMias Naturally Soft Merino (100% wool) for her design. Increases just before the armhole shaping are worked for a better fit. After joining the pieces together the roll neck is picked up and knitted in the round. 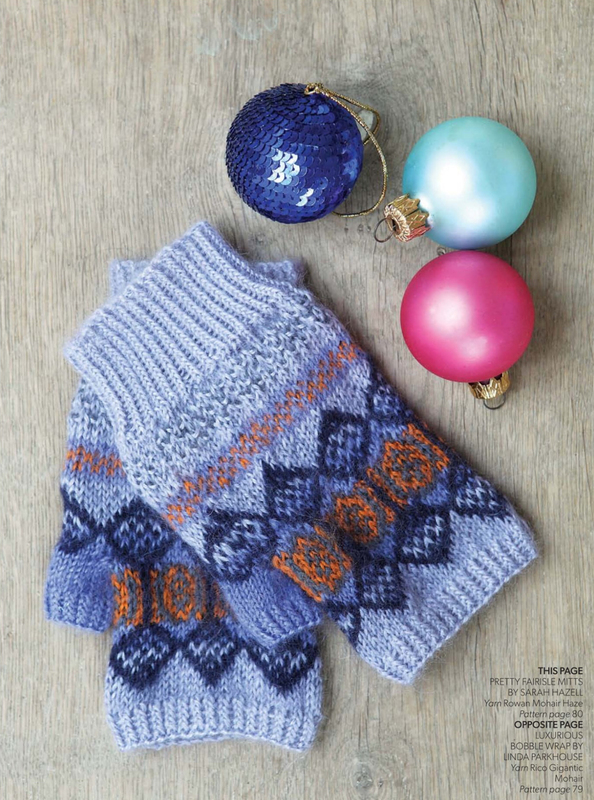 This stunning design by Natalie Warner is featuring an allover fairisle pattern. It is knitted using 3 shades of Rowan Felted Tweed DK (50% merino wool, 25% alpaca, 25% viscose). Back and fronts are knitted separately. The sleeves are formed by working increases and decreases and therefore knitted simultaneously with fronts and back. The cuffs and collar are picked up and knitted in a rib pattern before finishing. A Rolling Stone pattern in black and white forms this crocheted blouse by Camilla Ette Godfresdsen. Two strands of each DesignEtte Hokkaido (100% raw silk) and DesignEtte Andrea di Bonaiuto (70% super kid mohair, 30% silk) held together are used for this design. Two cables floating from bottom to top on the front of this jumper by Maisie Smith. 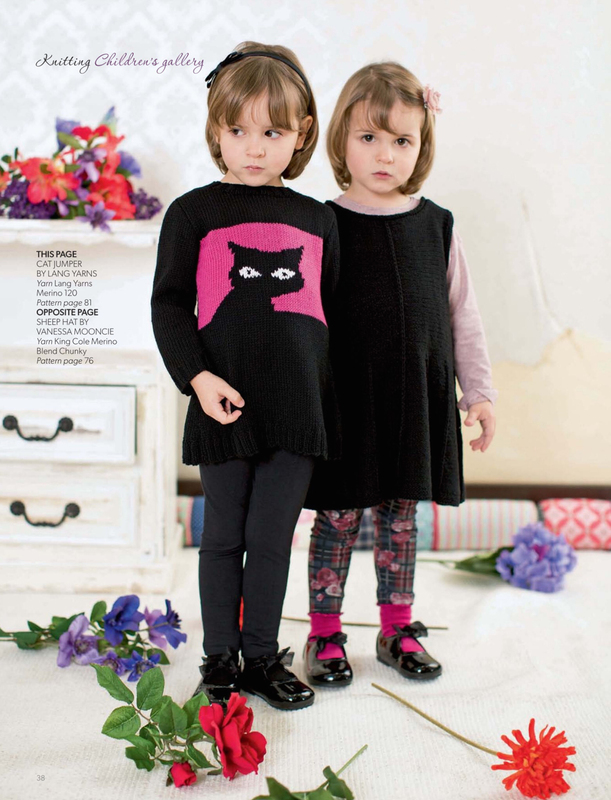 The garment is knitted flat and is featuring side shaping and an on trend tunnel neck. Shown here in Debbie Bliss‘ Rialto Chunky (100% wool) in shade 07 Gold. 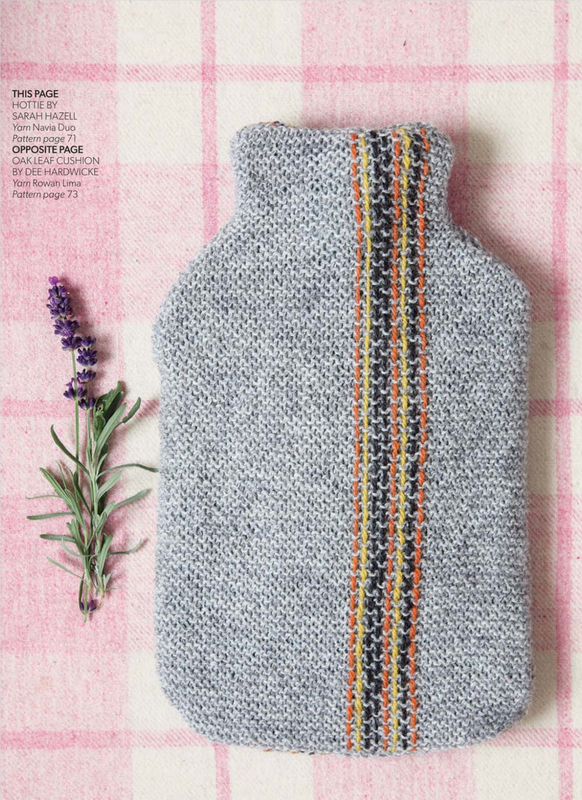 This relaxed design by Emma Wright is knitted using Louisa Hardings Esquel (60% merino, 20% llama, 20% silk) yarn in an easy to remember pattern. It is featuring drop shoulders, pockets, a scalloped edges formed during cast off and is knitted in one piece to the armholes. 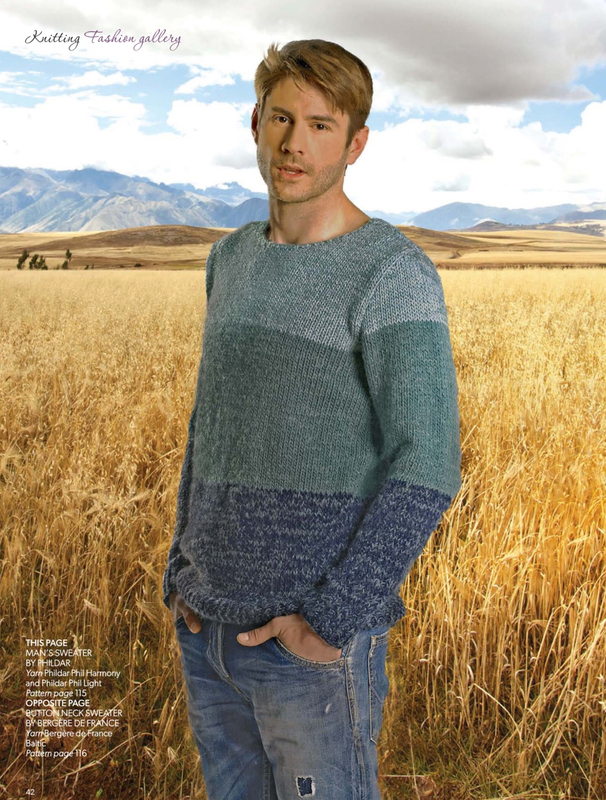 Pat Menchini used Rico Essentials Soft Merino Aran (100% merino wool) for this easy textured jumper for men. Raglan shaping, a collar and a button band with three buttons is shown in this design. The pattern is formed by cables and broken rib. A ribbed scarf is essential for this season. This one by Sarah Hazell is knitted using DY Choice Aran (75% polyacryl, 25% wool). 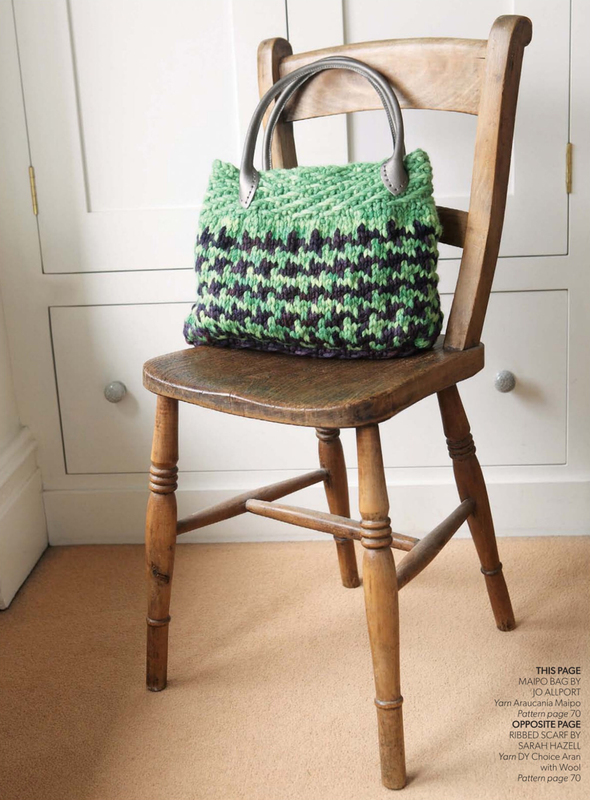 A Houndstooth Check pattern and a Herringbone pattern are shown on this bag by Jo Allport. It is knitted using Araucania Maipo (100% wool). 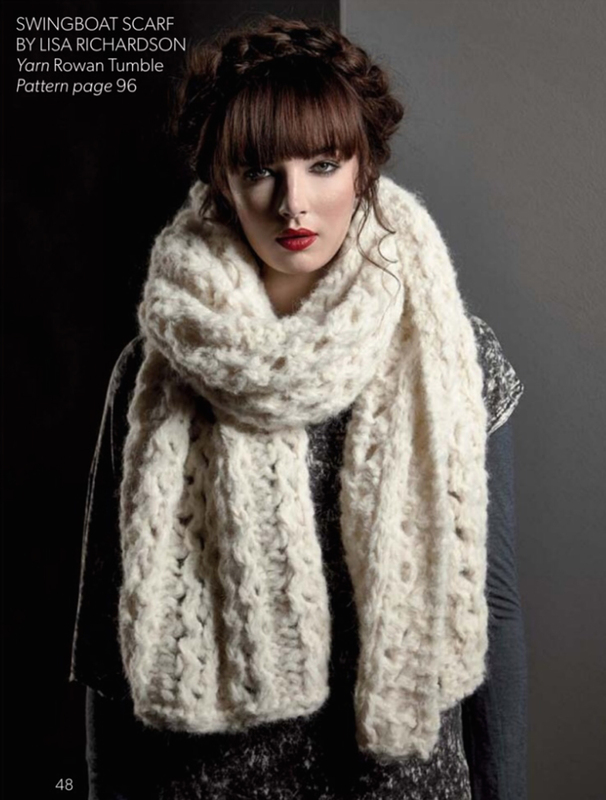 It’s getting cold outside, so stay warm with this Hottie by Sarah Hazell. Knitted in Navia Duo (100% wool). Isn’t it lovely, the garter stitch and the weaved coloured threads? 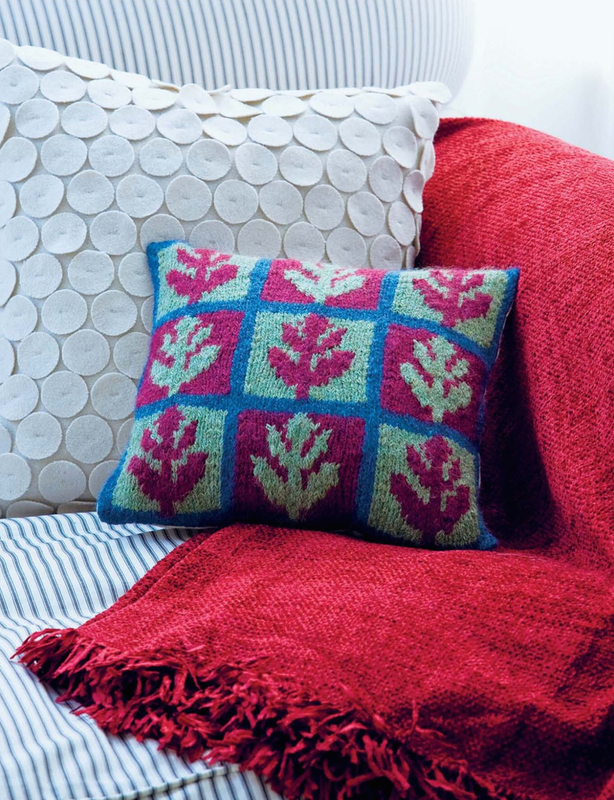 This cushion by Dee Hardwicke is knitted using Rowan Lima (8% merino wool, 84% baby alpaca, 8% nylon). It is knitted using intarsia technique and is showing a stunning oak leaf pattern. 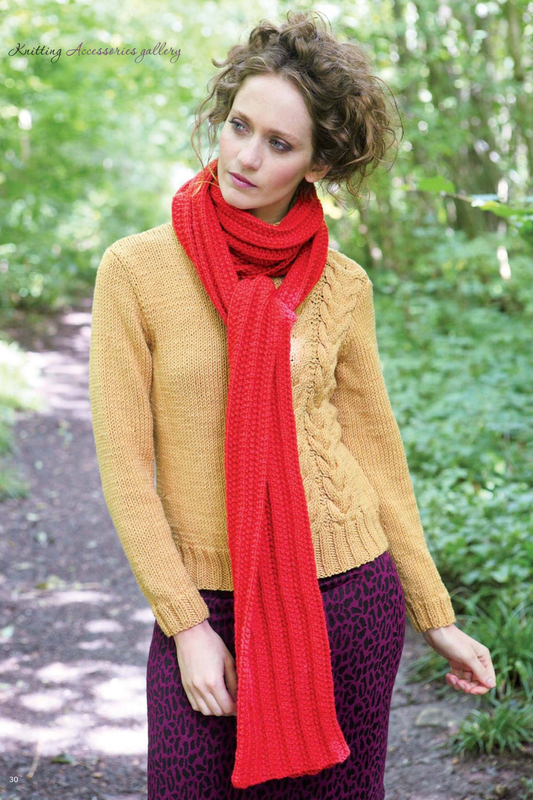 This pattern is originally published in ‘Little Colour Knits‘ by Dee Hardwicke, published by Rowan. 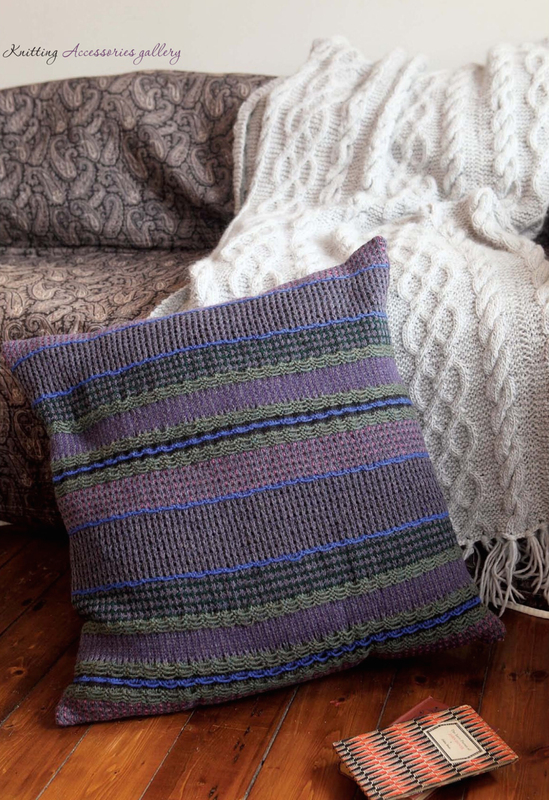 This lovely cushion by Caroline Birkett is knitted using 7 shades of Cascade 220 (100% Peruvian Highland wool). It is showing 5 different stripe alternating stripe patterns. The back is made of a matching fabric. The skirt is knitted flat and is featuring a bow in the same fairisle pattern as the hat. It is shown here in Bergère de France‘ Ideal (40% wool, 30% acrylic, 30% polyamide). To fit age 3mnt – 3yrs. (5 sizes are given). For cat lovers! This jumper by Lang Yarns is knitted using stranded technique. The cats eyes are embroidered on afterwards using duplicate stitch. Shown here in Lang Yarns Merino 120 (100% wool). This hat is started on the top and crocheted in the round. The shaping of the face is worked in rows. The ears are worked in the round. Button eyes and an embroidered nose finish the design. Shown here in King Cole Merino Blend Chunky (100% superwash wool). This design by Vanessa Mooncie is originally published in ‘Crocheted Animal Hats’ by Vanessa Mooncie, published by GMC Publications. 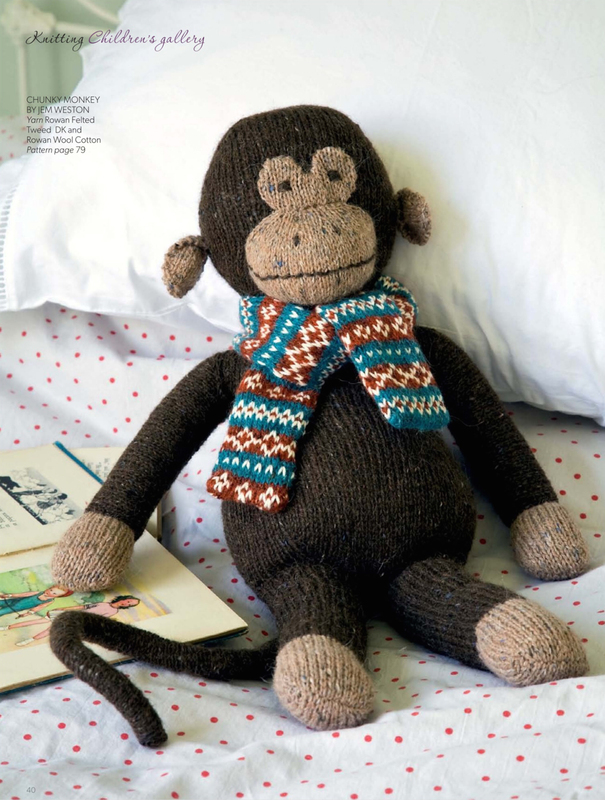 Jem Weston knitted this lovely Chunky Monkey in Rowan Felted Tweed DK (50% merino wool, 25% alpaca, 25% viscose). 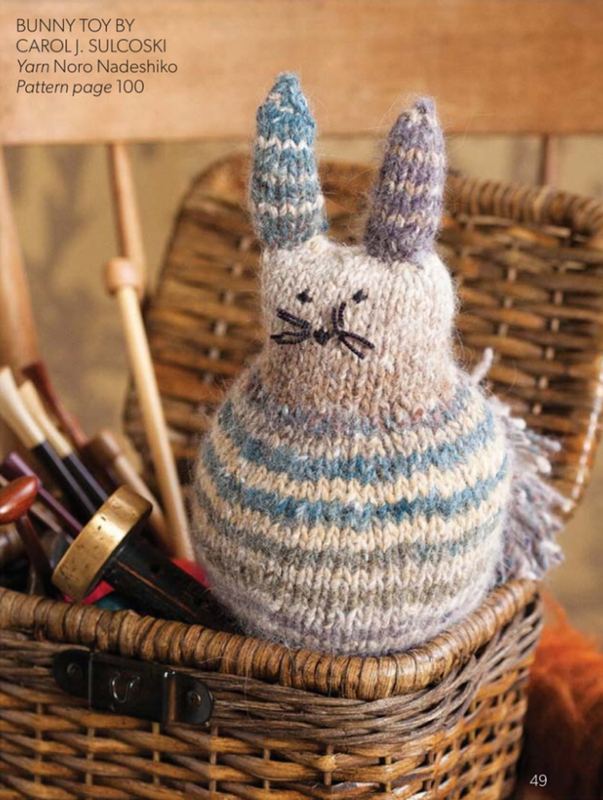 This pattern is originally published in ‘Cute Little Knits‘ by Jem Weston published by Rowan. 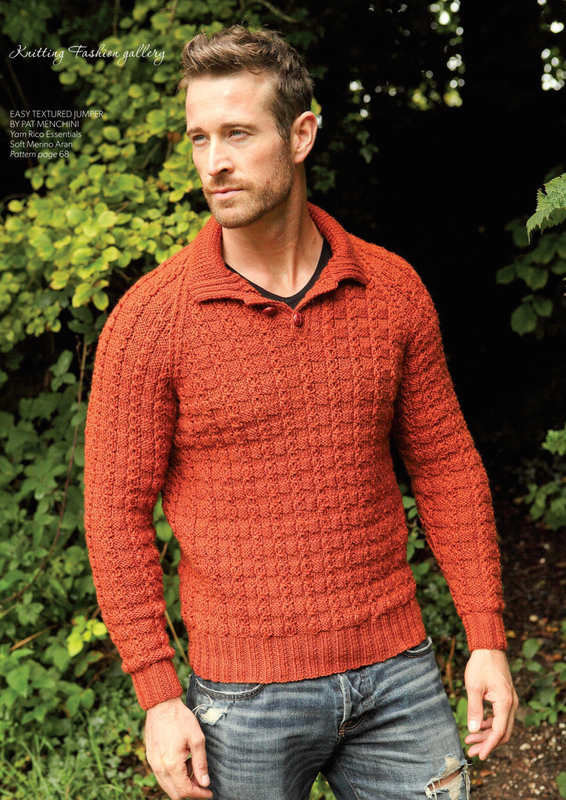 This jumper is knitted using Sirdar Country Style DK (40% wool, 30% acrylic, 30% nylon). This sweater is knitted using Sylecraft Life DK (75% acrylic, 25% wool). This sweater is knitted using Patons Fab DK (100% acrylic). This sweater is knitted using Wendy Ramsdale DK (100% wool). This sweater is knitted using Bergère de France Ideal (40% wool, 30% acrylic, 30% polyamide). 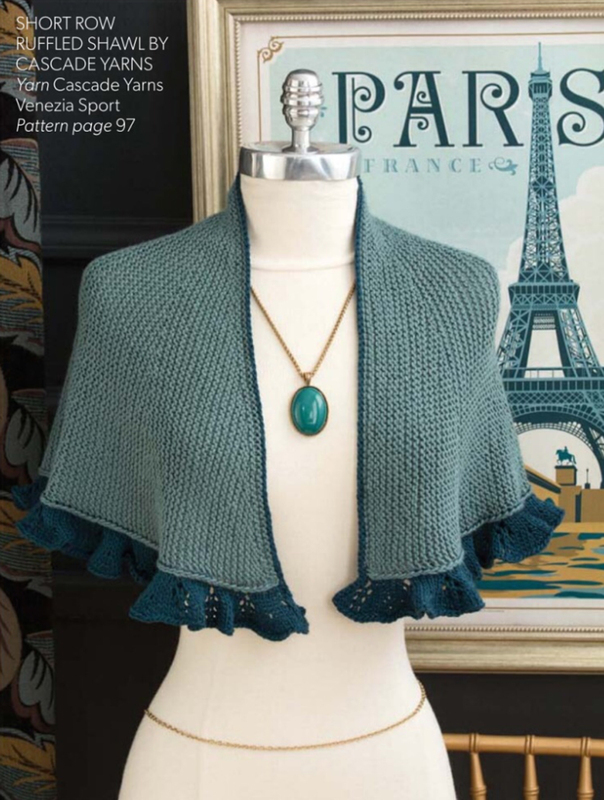 The next issue of Knitting magazine will be available on November 20 with 32 glamorous knits. All pictures of the patterns above are screenshots from my iPad and my purchased copy of Knitting magazine November 2014. 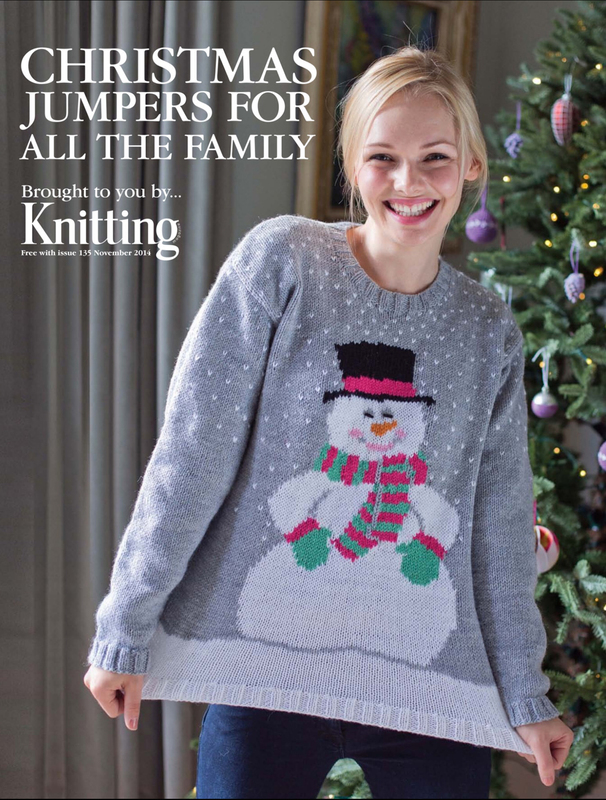 This issue of Knitting magazine comes with 40 new knits for the season. 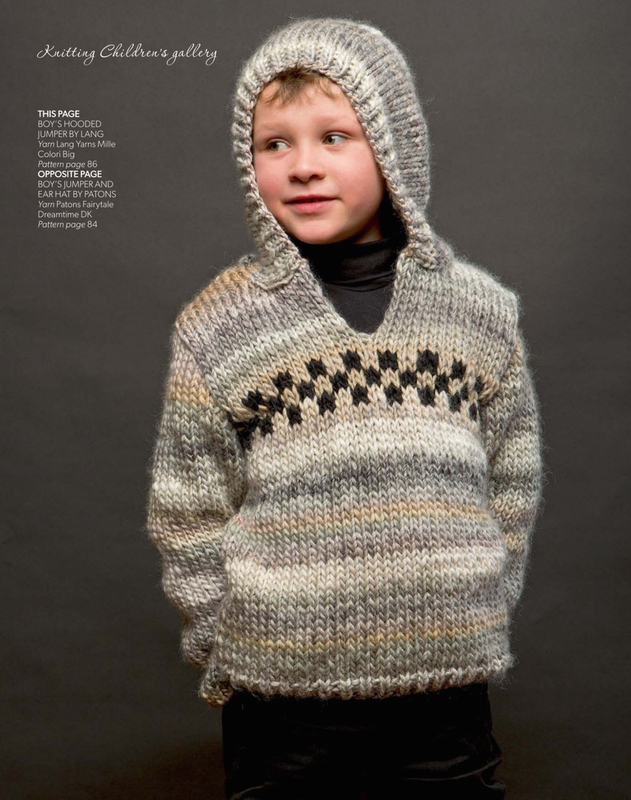 The Knitting magazine follows the fashion trend for big & oversized garments. 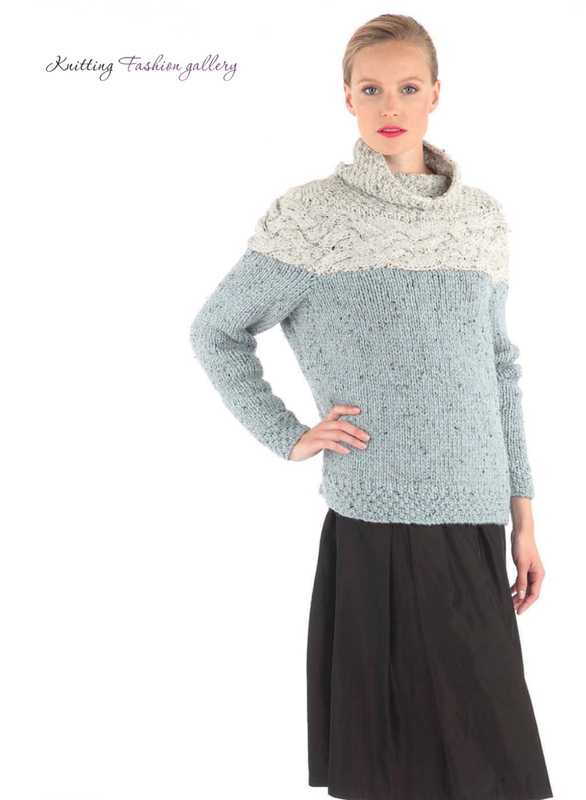 This sweater by Sian Brown is knitted in Sirdar Husky Super Chunky (87% acrylic, 13% nylon). Body and sleeves are knitted in a rib pattern. Moss stitch is used for hems and collar. This garment is knitted flat with a raglan shape and oversized sleeves, the collar is knitted on at last. I like the shape of this raglan very much, but I’m afraid wearing it, will be a not so good experience. If you want to substitute the yarn, remember to look for a yarn, which has a great meterage or the garment will much more than only oversized! This cabled sweater by Martin Storey is knitted in the new Rowan yarn Brushed Fleece (65% wool, 30% alpaca, 5% polyamide). This chunky and lofty yarn comes in 12 shades. Due to its great meterage (105m/50g) it is producing beautifully soft and featherweight Autumn/Winter knits. Swale is knitted flat featuring a raglan shape and a wide neck. The neckband is picked up and knit in a rib pattern. The gorgeous cables are floating from bottom to top on both body and sleeves. 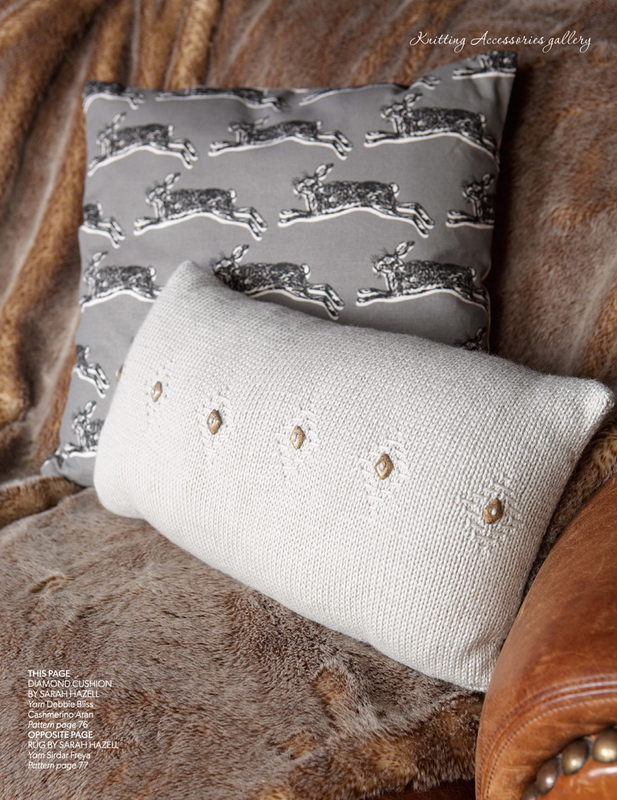 This pattern is originally published in Rowan Brushed Fleece featuring 16 designs by Martin Storey in Rowan Brushed Fleece. Debbie Bliss is also featuring a big cable, flowing from the hem to neckband on her jumper, knitted in Debbie Bliss Paloma Tweed (50% alpaca, 30% wool, 14% acrylic, 6% viscose). The jumper is knitted flat from bottom to top. Body and sleeves are joined to form a yoke which is knitted in the round. 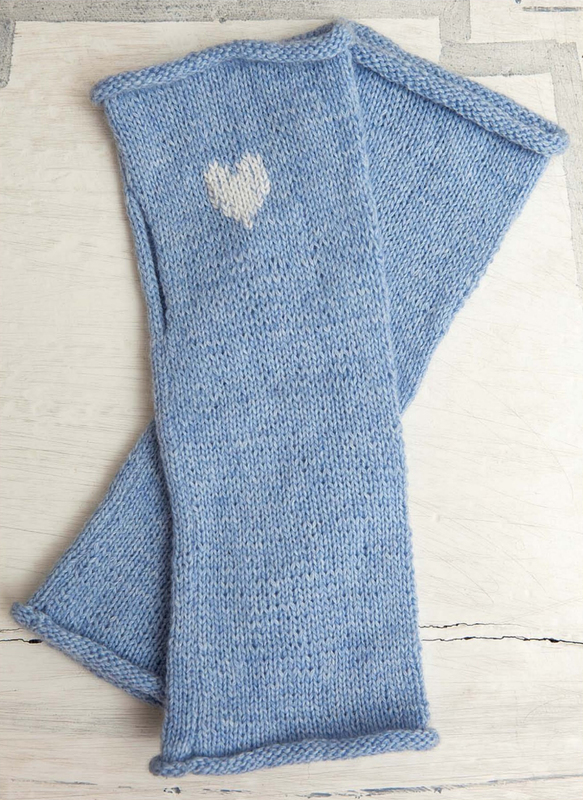 Alison Robson used Rico Essentials Soft Merino Aran (100% merino wool) for her heart jumper. It is knitted flat featuring cables and intarsia motifs on front, back and sleeves. Well, what to say about this design. “Don’t wear it, if you are older than 5 years!” Nice cables though. This is a lovely jumper knitted using Sublime Natural Aran (100% wool). This design by Pat Menchini is featuring different cable patterns (one with bobbles), three-quarter drop-shoulder sleeves and a funnel neck. The front neckband is knitted sideways with buttonholes, whereas the stitches for the back neckband are picked up. This cape looks very relaxed. It is a really must knit this season. You can wear it all the time. Sian Brown used Sirdar Big Softie (51% wool, 49% acrylic) for this design. Cables with a center bobble, divided by moss stitch panels forms the pattern. It is knitted flat in 3 pieces, which are joined at the shoulders and at the side seams. Another jumper, that won’t work. Although a nice idea using a horizontal cable as a yoke it creates more problems than it solves. It creates a puffy shape at the shoulders and you will look like an American football player. If you like that, Jo Allport has used 2 shades of Debbie Bliss Paloma Tweed (50% alpaca, 30% wool, 14% acrylic, 6% viscose) for this garment. Well I would have used other shades of Designer Yarns Choice Aran with Wool (75% polyacryl, 25% wool) than Sian Brown for this poncho. And I would be afraid of the weight (approx. 1000g) of the finished garment. I love the shape and the big turtle neck collar, but hope that the weight of the garment will not stretch it to much. Isn’t this cardigan looking cosy? This lovely piece by Erika Knight is knitted using Erika Knight‘s Maxi Wool (100% pure wool) which comes in a range of 15 vibrant shades. This garment is knitted flat showing stockinette stitch and a rib pattern for the front bands and hems. Emma Wright has used 2 shades of Sirdar Divine (72% polyester, 28% acrylic) a self striping yarn with a brushed effect for this jumper. 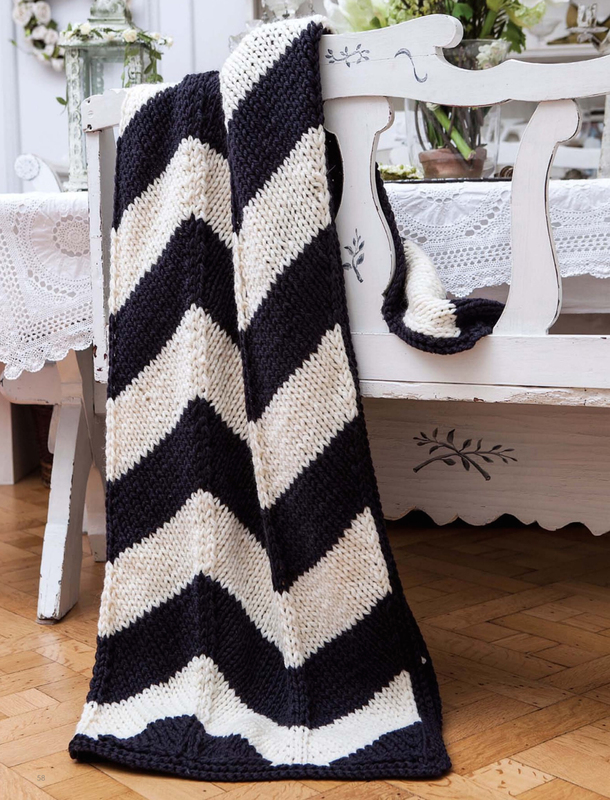 It is featuring a easy stitch forming a zigzag openwork pattern. Alternating use of the two shades creates an additional stripe effect. This sweater by Lisa Richardson is featuring to top trends for this season: stripes and dolman sleeves. The body is worked sideways in one piece and divided to form the neck opening. The hems and the collar are picked up and knitted in a rib pattern. It is knitted using 3 shades of Rowan Yarns Lima and 1 shade of Rowan Yarns Lima Colour (84% alpaca, 8% wool, 8% nylon). This lovely Coloured Panel Sweater by Natalie Smart is knitted using 3 shades of Rico Essentials Cashlana DK (80% wool, 20% cashmere). It is knitted using intarsia technique an is featuring raglan shaping. The white stripes are knitted with the garment using a slip stitch pattern. This Boho Top is knitted sideways and joined at the shoulder seams. The sleeves are picked up and knitted in a rib pattern. Sarah Hazell used Loisa Harding’s Noema (75% cotton, 30% acrylic 5% polyamide) yarn for this top. Wrapping the yarn twice round the needle and dropping the extra loop in the next row is forming an openwork pattern. Measurements: This garment measures approx. 70 cm wide and 70 cm in length. To make the garment shorter, cast on less stitches. To make the garment wider or narrower just work more or less repeats of the main pattern. Le Big Sweater by Pat Menchini is knitted using Stylecraft Life Super Chunky (25% wool, 75% acrylic). Although lovely I would have added some side shaping to make this garment a little bit more fashionable. It is featuring a lovely slip stitch pattern and drop shoulders. This top by Amanda Jones is really lovely, but don’t knit the sleeves in this pattern. Use garter stitch only or maybe a sequence of purl and knit rows, but try to avoid this pattern looking not very flattering. This top is knitted in Rico Essentials Soft Merino Aran (100% merino wool). 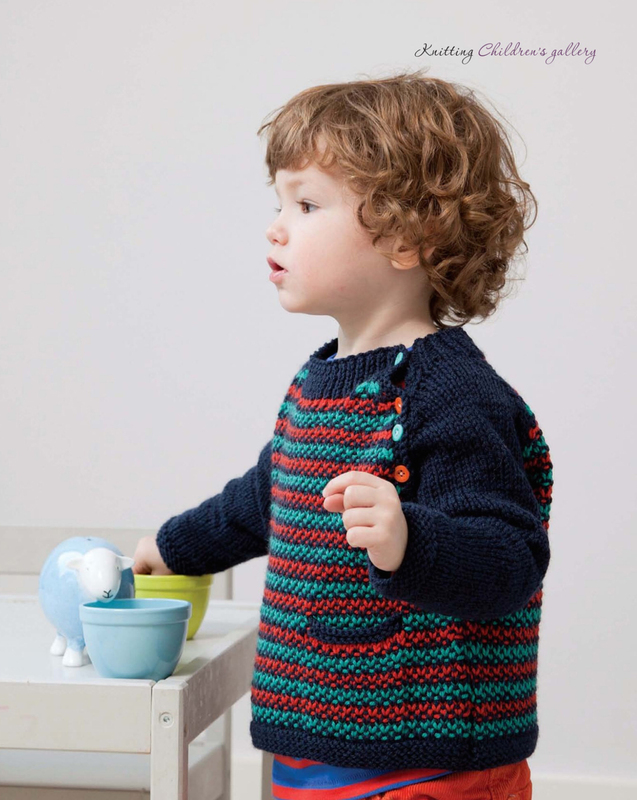 This crisp looking jumper by Sian Brown is featuring coloured circles, which are knitted using intarsia technique. The pattern is printed as a chart for easy knitting. A deep round neck and set-in sleeves completes the design. This jumper is knitted using 5 shades of Sublime Extra Fine Merino (100% extra fine merino). I love this jumper by Maisie Smith. Isn’t it looking flamboyant? 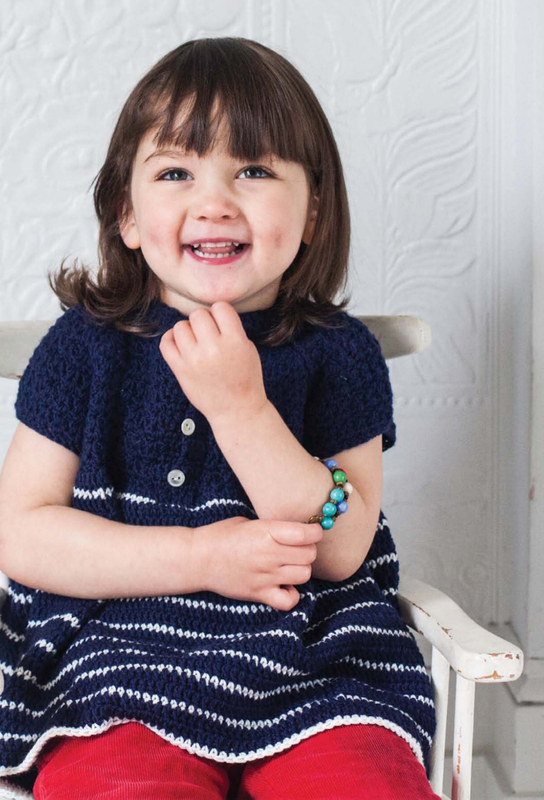 A easy broken rib pattern is used to knit this garment. It is featuring a big tunnel neck and drop shoulder shaping. Maisie Smith used Debbie Bliss‘ Roma yarn (70% wool, 30% alpaca) for this jumper. 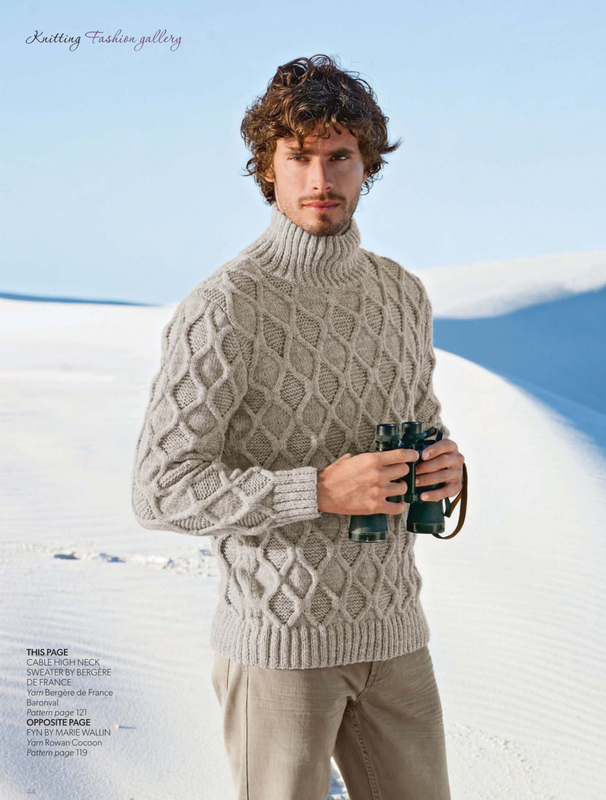 This Man’s Sweater by Phildar is knitted in 3 shades of Phildar Phil Harmony yarn (49% acrylic, 51% wool). Easy going stockinette stich and a round neck makes a design a man would wear. This sweater by Bergère de France is featuring a lovely cable pattern and an unusual button neck. It is knitted using Bergère de France’ Baltic yarn (60% acrylic, 40% polyamide). Marie Wallin designed this man’s cardigan in Rowan Yarns super soft Cocoon (80% merino, 20% wool). It is featuring a stunning cable pattern and garter stitch. The front bands are picked up and knitted in a rib pattern. This design is originally published in the new Rowan Knitting & Crochet Magazine 56. This High Neck Sweater by Bergère de France is showing a stunning cable pattern on both body and sleeves. It is knitted in Bergère de France Barnoval yarn (40% hemp, 60% combed wool). Fur is on the catwalk these days. Sarah Hazell used Erika Knight’s Fur Wool (97% wool, 3% nylon) to knit this waistcoat. 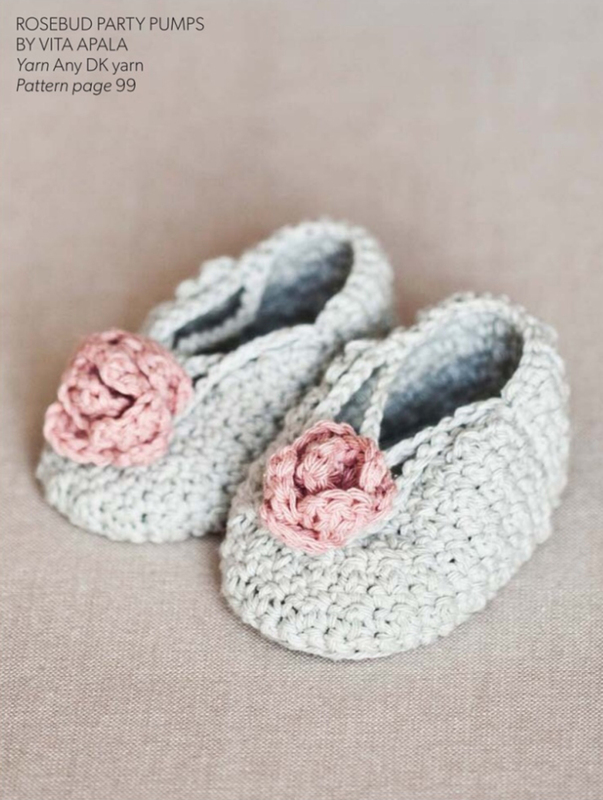 It is knitted in one piece and the pattern is provided for one size only. This simple striped scarf is knitted using 2 shades of Rowan Yarns Big Wool (100% wool). Sarah Hatton designed this lovely beanie using Rowan Tweed (100% wool) featuring a stunning cable pattern. This yarn is spun in the UK and incredibly soft. The pattern is written to knit this beanie flat and seam it at the back, but it is easily adjustable for knitting in the round, too. To fit average size head. Sarah Hazel used self-striping Regia Adventure 6ply and plain Regia 6ply for these long socks. The hem is showing a lovely lace pattern, whereas the rest of the sock is knitted in easy stockinette stitch. Size: To fit average size feet. Wouldn’t these wrist warmers make a wonderful and luxury gift for Christmas? Jemima Schlee used CashmeRED cashmere (100% cashmere) for this design. This throw by Sarah Hazell is started with a central square. The next panels are picked up an knitted around this center square. A chart is given for placement and sizing of the panels. A lovely idea but I’m in need to get used to the colours of Todd’s Handknits Fantasia Baruffa Bulky (100% wool). Showing different cable patterns this design by Sarah Hazell is knitted using Rowan Yarns Big Wool (100% wool). Also knitted in Rowan Yarns Big Wool (100% wool) Penny Hill is going for a chevron pattern in this throw. This would make a lovely gift for someone using a Kindle. This cover by Sarah Hazel is showing a nice cable pattern and is knitted using Rooster Almerino DK (50% baby alpaca, 50% merino wool). This felted bobble bag by Caroline Birkett is knitted in a single piece with the strap worked separately. It is knitted using Rowan Big Wool (100% wool) and the new Rowan Big Wool Colour (100% wool). After knitting it is felted in your washing machine. Size 35 x 25cm (14×10′) at base. Kat Goldin designed this striped top using MillaMia 4ply (100% wool) yarn. It is a good design for practicing crochet. To fit age 6mnt – 8 yrs. (6 sizes are given). 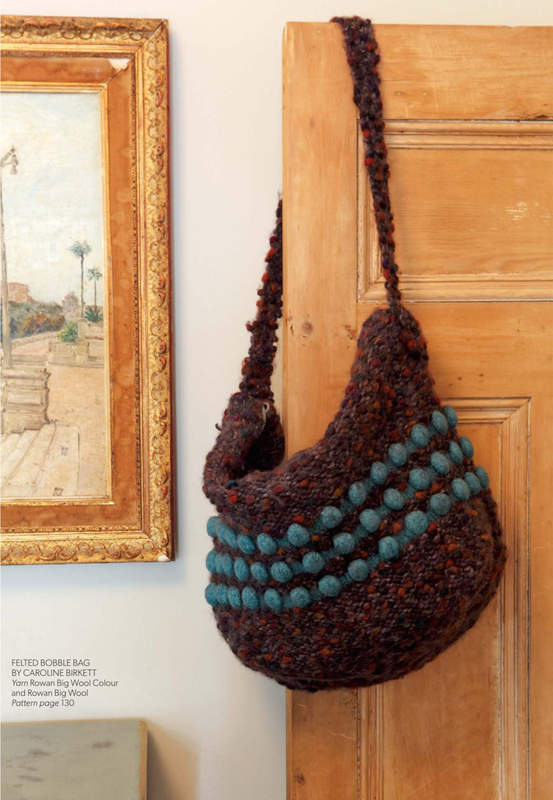 To find this and more creative crochet patterns by Kat Goldin look for Hook, Stich & Give by Kat Goldin. Published by Kyle Books. 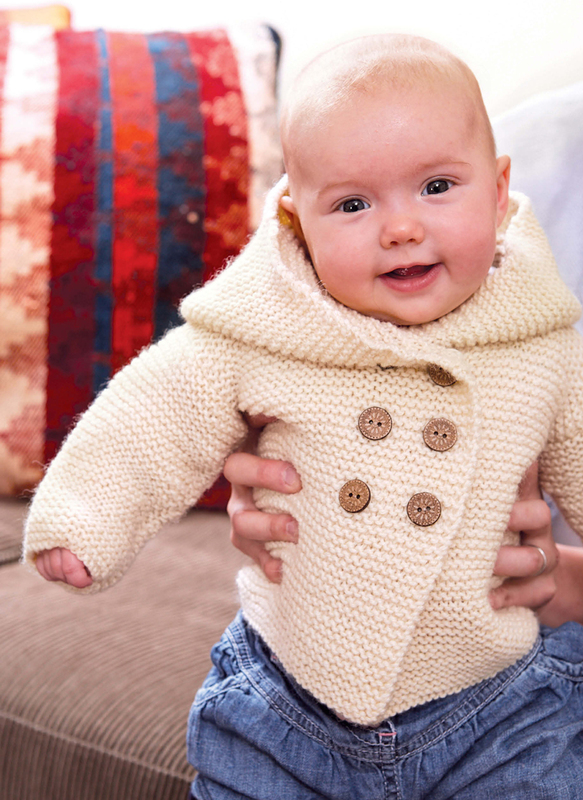 3 yarns and a slip stitch pattern creates this cute little raglan sweater to fit age 6-9mnths to 4-5yrs (5 sizes). It is knitted using Debbie Bliss’ cashmerino aran (55% merino wool 35% acrylic, 12% cashmere). This cable panel cardigan by Patons is knitted using Patons Diploma Gold (55% wool, 25% acrylic, 20% nylon). 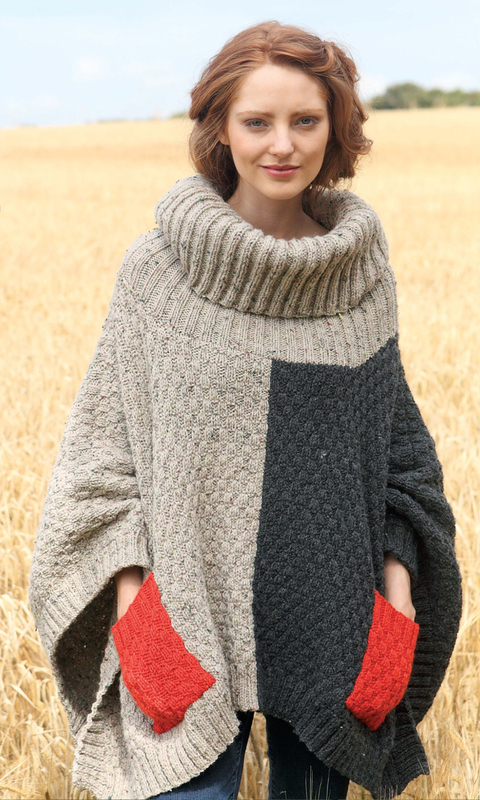 It is showing a lovely cable pattern, featuring set-in sleeves and a round neck. The front bands are picked up and knitted in a rib pattern. This fair-isle jacket by Bergère de France is featuring a zipper closure. 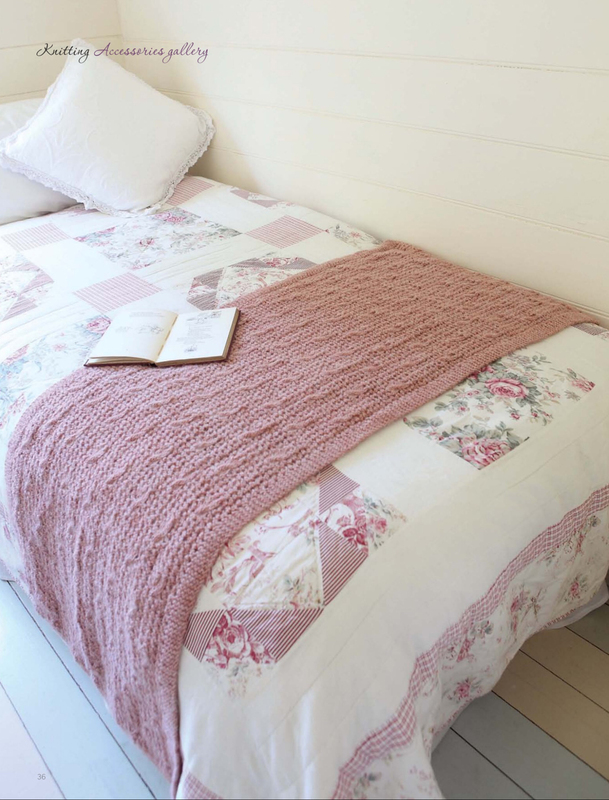 It is knitted in Bergère de France Duvetine (73% acrylic, 19% polyamide, 8% polyester). 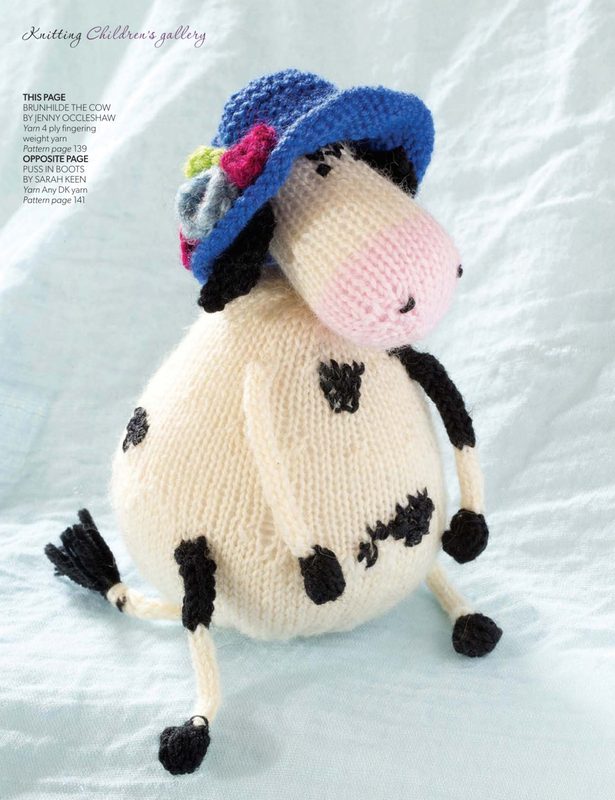 Brunhilde the Cow by Jenny Occleshaw is knitted using a 4ply weight yarn. It is originally published in ‘Knitted Miniature Animals’ by Jenny Occleshaw. Published by New Holland Publishers. 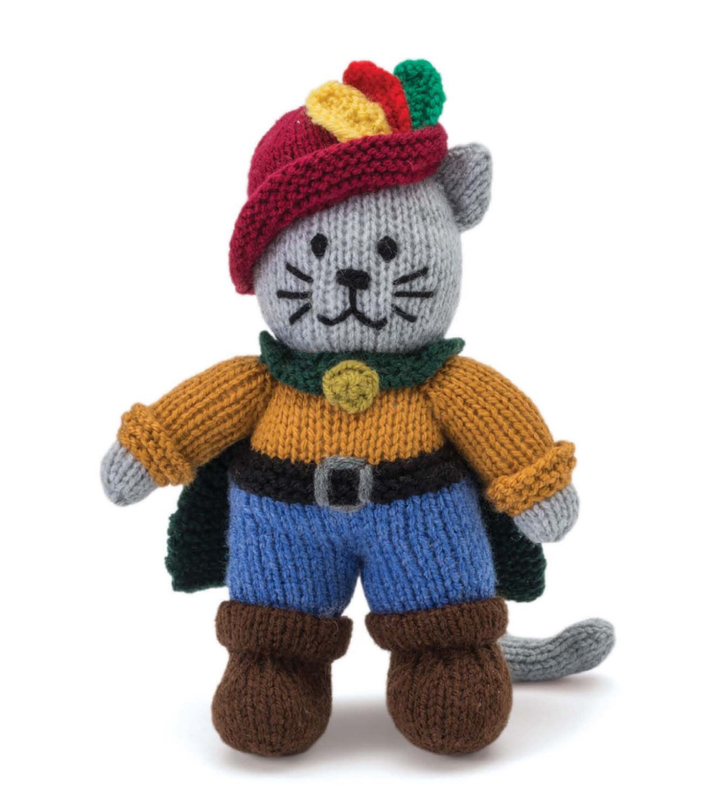 The Puss in Boots by Sarah Keen is knitted in an DK yarn and originally published in ‘Knitted Fairy Tales’ by Sarah Keen. Published by GMC Publications. Originally published in ‘Animal Hats to Knit’ by Louise Roberts (published by GMC Publications) this hat is knitted in Rowan Creative Focus Worsted (75% wool, 25% alpaca). 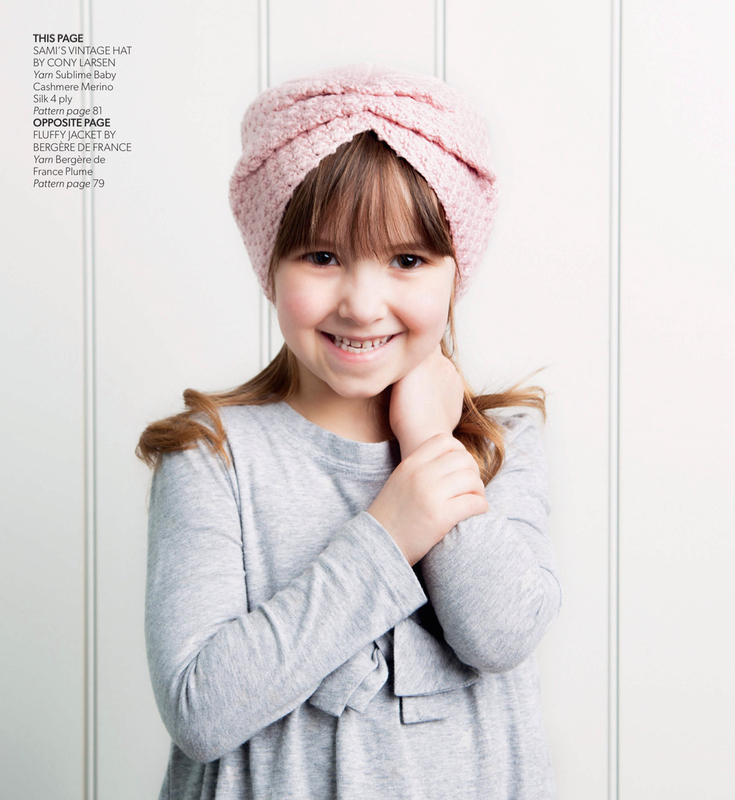 The pattern is given for a child or and adults heat and is designed for a close fit that covers the top of the ears. The next issue of Knitting magazine will be available on October 23 with 21 late fall fashion knits and 5 family knits for Christmas. All pictures of the patterns above are screenshots from my iPad and my purchased copy of Knitting magazine October 2014.